The National Center for Advancing Translational Sciences (NCATS) of the National Institutes of Health (NIH) is seeking the scientific community’s input into the development of its five-year strategic plan. This is NCATS’ first strategic plan since its creation in the National Institutes of Health Reform Act of 2006 (P.L. 109-482). Accordingly, NCATS has issued a request for information (RFI), “Soliciting Input for the National Center for Advancing Translational Sciences (NCATS) Strategic Planning Process” (NOT-TR-16-002). Comments are due January 8, 2016. For more information and/or to provide input see the notice. The National Institutes of Health (NIH) recently issued a time-sensitive Request for Information (RFI) (NOT-OD-15-118) inviting comments and suggestions on the framework for its congressionally-mandated NIH-wide Strategic Plan. NIH is requesting feedback by August 16, 2015. The agency also plans to host webinars in early to mid-August to gather additional input. The National Institute on Aging (NIA) and the National Institute of Mental Health (NIMH) within the National Institutes of Health (NIH) are seeking public comment on the development of the Institutes’ strategic plans. The plans will guide the Institutes’ research priorities. The NIA recently released a request for information (RFI) seeking guidance on its strategic plan, Aging Well in the 21st Century: Strategic Directions for Research on Aging. 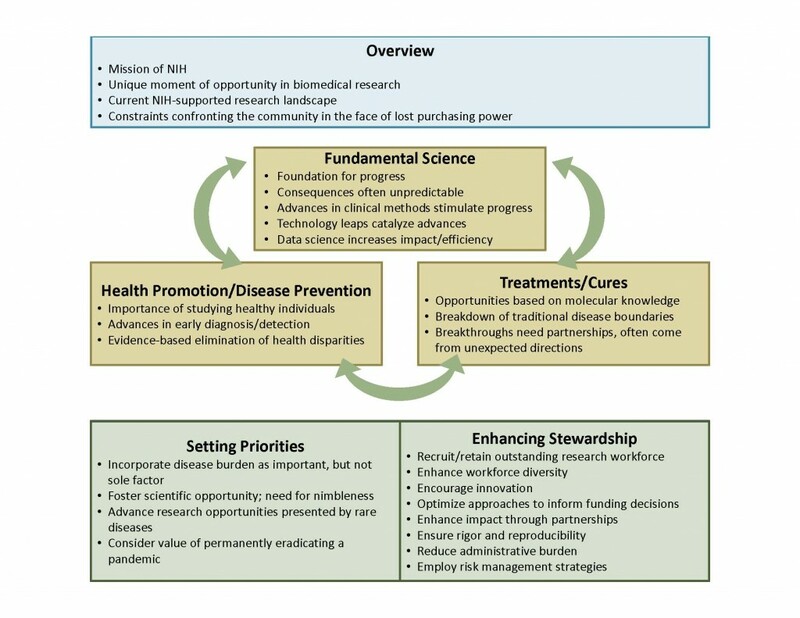 The draft plan outlines NIA’s broad strategic directions for the Institute and “provides a point of reference for setting priorities and a framework for systematically analyzing the Institute’s scientific portfolio and assessing progress.” Its goals falls into three categories: understanding the dynamics of the aging process; improving health, well-being, and independence of adults as they age; and supporting the research enterprise. Better understand the biology of gaining and its impact on prevention, progression, and prognosis of disease and disability. Better understand the effects of personal and societal factors on aging, including the mechanisms through which these factors exert their effects. Develop effective interventions to maintain health and function and prevent or reduce the burden of age-related diseases, disorders, and disabilities. Improve our understanding of the aging brain, Alzheimer’s disease and other neurodegenerative diseases. Develop interventions to address Alzheimer’s and other age-related neurological conditions. Improve our understanding of the consequences of an aging society to inform intervention development and policy decisions. Support the infrastructure and resources needed to promote high quality research. Disseminate information to the public, medical and scientific communities, and policy makers about research and interventions. Specifically, NIA would like feedback regarding (1) research needs and opportunities that should be added to the plan and (2) emerging research needs and future opportunities that should be included in the plan. Responses will be accepted until December 15, 2014 and must be submitted via email to the NIA Office of Planning, Analysis and Evaluation at niaplanning@nia.nih.gov. The National Institute of Mental Health’s revised Strategic Plan is intended to guide its priorities from 2015–2020. Accordingly, NIMH is inviting public comment and is specifically interested in receiving ideas for “scientific advancements, new technical capabilities or tools, or major challenge topics that promise substantial change to mental health research if pursued.” NIMH is the largest funding agency for mental health research. The 2015–2020 plan revises the original four high-level Strategic Objectives which are intended to serve as a “broad roadmap” for NIMH’s priorities. The revised plan also includes cross-cutting themes that are relevant to each of the objectives. These themes include: transforming diagnostics, accelerating therapeutics, the growing digital enterprise, transforming the trajectory of mental illnesses through preemptive medicine, global mental health, mental health disparities, partnerships, and training future research scientists. Responses to the draft plan are due by December 11, 2014and can be submitted to: NIMHSTRATPLAN@mail.nih.gov. Additional information is available here.